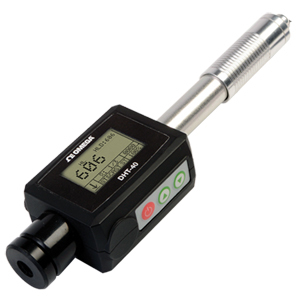 The DHT-40 is a pen style hardness tester. It has premium integrated electronics packaged into an easily portable pocket sized case which includes the impact device. State-of-the-art technology gives extraordinarily high accuracy. The DHT-40 uses the Leeb method to measure hardness of any metal or surface for a wide variety of industrial purposes. The Leeb method is noted for its accuracy, wide measuring range and operating simplicity. The DHT-40 hardness pen conforms to the Standard ASTM A956 and comes with a USB cable and software for PC downloading of data. A rugged carrying case and test block are also included. 注: Comes complete with DHT-40 with impact device, small support ring and cleaning brush, standard hardness test block, AC adaptor/charger, software (CD), 3.7V Li-ion rechargeable battery (internal), USB cable and operator’s manual.